As an Animal Communicator, my practice is based on the knowledge that animals understand humans' words and intonations. It's validating when science validates what I've intuitively known. The Family Dog Project. located in Budapest, Hungary recently released a scientific study that shows how a dog's brain responds to human speech and understand what the tone of your voice is communicating. Scientists used dogs trained to lie still in a MRI machine so their brains could be studied while responding to human words and the intonation of those words. The study concluded that dogs and humans use the same part of the brain to process speech and speech recognition. According to Science News, "Dogs process speech much like people do, a new study finds. Meaningful words like “good boy” activate the left side of a dog’s brain regardless of the tone of voice used, while a region on the right side of the brain responds to intonation." This video from the Family Dog Project explains how dogs respond to human speech and speech recognition. The scientists behind this study also conclude that other animals, like cats, understand humans in the same way as dogs do. So the next time you strike up a conversation with your pets, keep in mind that they know what you are saying and understand what the tone of your voice is conveying. 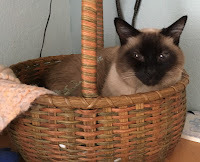 It still feels surreal, and a lot like a miracle, that my 15 year old Siamese cat, Elvis, vanished into thin air a few weeks ago, only to return inexplicably 12 days later. One minute he was in the house, and the next minute, Elvis had left the building. This was odd, given that Elvis is an indoor-only cat. The day before he disappeared, Elvis communicated telepathically that he “would be leaving me soon.” I was startled and concerned. Leaving me? What was Elvis talking about? Unfortunately, he didn’t elaborate. I wasn’t sensing that Elvis was ready to transition, although he hadn’t been feeling well recently, due to a spate of vomiting up hairballs. In an ongoing effort to keep the formation of hairballs to a minimum, I brush his beautiful, medium dense coat daily. In all other aspects of his health, he seemed fine. I told Elvis he was going to be fine, kissed his adorable face, and went on with my day, pushing his cryptic message out of my mind. The next morning, Elvis and his kitty sister, Mona Marie, ate their breakfast and then headed off for their morning nap. I went on with my day, which included going out for a couple of hours, returning a little after noon. When I walked in the front door, I didn’t see either cat, which was not unusual, since Mona and Elvis love to catnap. In the late afternoon, my dog, Bodhi Bear and I went out for an event. Upon our return, Mona was sitting on her cat tree demanding supper. Elvis was a no show, which at the time, didn’t strike me as odd, because he sometimes waits until I’m ready for bed to ask for his dinner. As I cleaned up after my dinner, I realized I hadn’t seen Elvis since breakfast. I immediately called out to him verbally and telepathically. In that moment, I felt intuitively that Elvis was not in the house or even outside of the house. Telepathically, Elvis wasn’t responding. This was highly unusual because Elvis and I share a strong, loving bond with excellent telepathic communication. Plus, he’s a typical Siamese with a distinctive, loud meow. For Elvis to be non-communicative as well as MIA for his supper, something had to be terribly wrong. I remembered Elvis’ cryptic message, which started to weigh heavily on my heart and mind. I had a sick feeling in my gut that I might not ever see my boy again. It was a scary thought that I couldn’t fathom at the time. I began looking for him. When I tuned into my intuitive self, I felt strongly that Elvis was alive and possibly trapped somewhere nearby; perhaps in a garage, a couple of houses away. It was the only logical explanation for him not returning home. Yet, without finding Elvis, I had no positive way to know his location. At this point, it was about 4 am. It was too early to call for help so I decided to send Reiki in hopes it would help Elvis find his way home, dispelling any obstacles in his path. I continued sending Reiki throughout the ordeal, knowing Reiki could help Elvis in ways I never could. At first light, I got the word out about Elvis’ disappearance. I texted family, friends and neighbors to let them know that Elvis was missing. Within a few short hours, my neighbors knew Elvis was missing. I knew there are a number of things I needed to do quickly when an animal goes missing. Besides calling my family, friends and neighbors, I made posters that were immediately hung in the neighborhood, local veterinarian offices and pet hospitals. My neighbors looked in their homes, garages, backyards and around the general neighborhood numerous times. Still, there was no sign of my little Siamese. A missing animal report was filed at the local animal shelter. Friends continued to monitor the shelter while he was missing. Thank goodness, he had a microchip, in case someone brought him to the animal shelter or animal hospital. His microchip gave me some peace of mind. A neighbor posted Elvis’ disappearance on www.nextdoor.com. I posted Elvis’ disappearance on Fido Alert and www.TabbyTracker.com. My Facebook friends shared Elvis’ information and sent prayers. I believe in the power of prayers and have no doubt, that their prayers would help Elvis no matter where he was. I never posted on Craig’s list feeling strongly that Elvis was not far away or was with another family. Elvis is a loving and affectionate cat with me, a true “Mama's boy.” Yet, he is a shy cat around people. My gut told me that Elvis was not with another family, which brought me back to the idea that he was trapped somewhere close by. 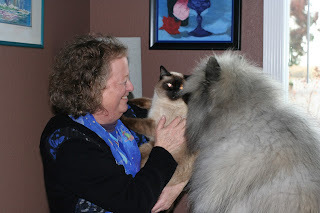 I reached out to two other Animal Communicators, including my Animal Communication mentor. Like me, they received similar information from Elvis, confirming that he was hunkered down somewhere close by and would be home, if he was able to extricate himself. He didn’t reveal his location to them, either. Throughout the ordeal, Mona Marie spent a lot of time sitting on the master bedroom windowsill, staring at the house two doors away. I asked Mona if she knew where Elvis was. She said he was close by and that asked him to come home. Mona was incredibly supportive and loving, which I appreciated and needed. Communicators to know if an animal is alive or dead is that animals (and humans, too) are Spirit that then animates a physical body. Communicating telepathically with an animal can feel virtually the same whether the animal is alive or not. Therefore, it’s impossible to know if an animal has died; the only sure way to know is to find the animal. Most Animal Communicators, like myself, don’t take on missing animal cases because of this aspect of telepathic communication. imaginable. Was he alive? Was he dead? Where is his body? Some moments, I was able to remain grounded, knowing that frantic energy can negatively impact a missing animal. Other times, I cried like a baby at the thought that I’d never see my boy again. food and water for so long. The weather was hot and dry with several days reaching 100+ degree temperatures. My neighbors and I continued to search the neighborhood for Elvis. My friends, including my wonderful Facebook friends, whose ongoing support boosted my morale with their kind words and prayers. By day eleven, I couldn’t look any more. I had to let go of knowing if Elvis was going to come home. I felt completely out of balance not knowing if he was alive or dead. One part of me needed to know what had happened and the other part wanted to trust in my intuition that he was trapped close by. I found the more desperate I felt, the more anxious I became. I had to let go of the outcome. My mind needed to take a break, to allow my heart and intuition to take over, once again. I came to acceptance that Elvis is his own being with a mind of his own. If he needed to leave the house or his body, there was nothing I could do. Elvis' chose to go on a “walkabout.” If he was trapped, I prayed he'd be released. If he had transitioned, I hoped he left quickly and painlessly. Although I let go of the outcome, I couldn’t let go of the possibility that Elvis might still come home. I continued to send Reiki and stay open for a miracle. had to move forward with life without Elvis. Out of the corner of my eye, I saw a little Siamese kitty body running towards my neighbor's backyard. OMG! Is that Elvis? It was Elvis! At that moment, I became a believer in miracles! starving. Elvis then proceeded to wolf down three huge bowls of food and drank lots of water. indicating that he had tried very hard to get free. Otherwise, Elvis was in good spirits and grateful to be home. Me, too! each other since they were two months old. stop my Siamese friend from going on his “walkabout.” It seems like something was calling him to leave the house. It was heartbreaking thinking that Elvis wanted to leave me and his body without being by his side. At one point, when I felt he may have transitioned, I felt devastated by his decision, it didn’t make sense to me. If it was his time to transition, I didn’t want him to be alone, I wanted to support him. But it wasn’t my choice to make. It was Elvis’. I have a new appreciation for missing animals. In my experience, missing animals are rarely about the animal, but about how we respond when our beloved friends can’t be found. It’s easy to forget that animals have their own personal choices, spiritual paths and agendas that many times have nothing to do with the people they love. afloat when I felt like I was drowning in sadness. One thing I know for sure is that we will never know what truly happened to Elvis on his walkabout. For all I know, Elvis may have transitioned and was “called back” to his body to live out his life with me by some magical force in the Universe. No matter what happened, I’m ecstatic that a miracle occurred and Elvis is home safe and sound.